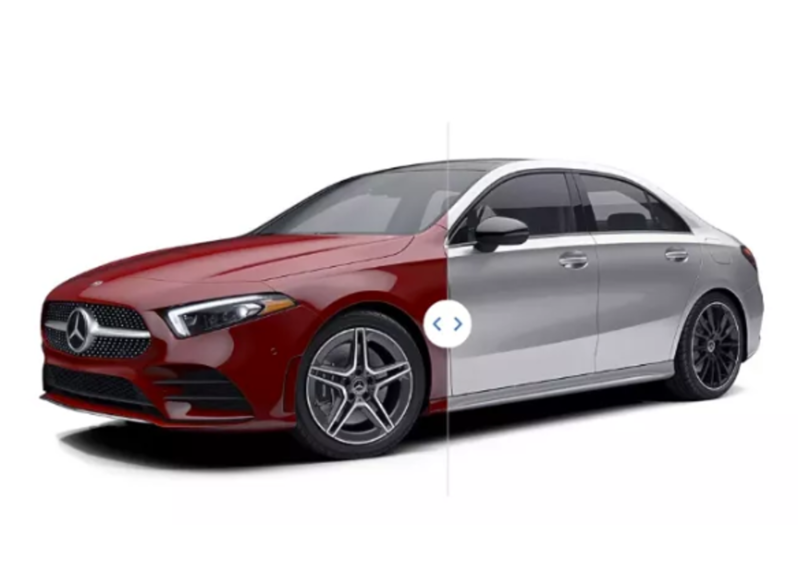 Positioned as the entry point to the Mercedes-Benz lineup, the all-new A-Class sedan is available in front or all-wheel-drive and is based on the same platform as the CLA, which Mercedes-Benz refers to as a coupe, offering more space and practicality. Exterior styling is conservative and proportions are tidy. Inside, the brand’s latest design language translates well into the A-Class with a more cohesive and upscale look than can be found in the CLA, or GLA for that matter. Technology and safety features from higher up in the Mercedes-Benz lineup have found their way into the A-Class. A suite of advanced safety features is available as is an extra large touch-screen interface. With a starting price in the low $30’s, the A-Class is the least expensive model in the brand’s lineup and it’s aggressively positioned against the Audi A3, its closest rival. Let’s build one and explore the A-Class in detail. Two models are initially available for the A-Class, the front-wheel-drive A 220 and all-wheel-drive A 220 4Matic. Both have identical 0-60 mph performance and are propelled by a 2.0L inline-4 turbocharged engine that produces 188 hp and is matched to a 7G-DCT dual-clutch transmission. The A 220 has a starting price of $32,500, with 4Matic costing an extra two grand. We’ll select the front-wheel-drive model to keep the price in check and allow room for options. Let’s proceed to the next stage of the build. The color palette for the A 220 is fairly bland, with only bright Jupiter Red standing out. However, in some ways understated colors fit the conservative design of the A-Class. Denim Blue metallic is a pleasing grayish-blue that is more interesting than the several blacks and grays on offer. A charge of $720 is incurred for metallic pain. In terms of wheels, the standard 17-inch 10-spoke design best fits the proportions of the A-Class, which can be overpowered by the optional larger wheels. Time to move on to the interior. The cabin is nicely executed with a unique design that is visually distinctive from the other sedans in the brand’s lineup. The a section of the dashboard spans from door to door for an airy and modern look. Finely detailed circular HVAC vents and metalwork detailing throughout the cabin impart an upscale feel. The flat-bottomed steering wheel with brightwork adds an a classic appearance. As you might expect, MB-Tex upholstery comes standard while leather is optional. Since leather comes standard on the Audi A3 and has some superior qualities to MB-Tex, we’ll spring for that on the A 220 at a cost of $1,450. Unfortunately, the lovely Macchiato upholstery which brightens up the cabin and provides a nice contrast against the dark carpeting and dashboard is only available in MB-Tex. Bahia Brown is the nicest leather interior color available and goes nicely with the blue exterior. The optional walnut trim ($325) add a touch of warmth and elegance to the interior, so let’s select that and move on to options and package. Here we have the opportunity to outfit the A 220 with luxury features like heated and ventilated front seats ($1,030), a heated steering wheel ($250), and 64-color ambient interior lighting ($310). All of these options are reasonably priced and well worth the investment. Curiously, multicontour front seats are not available with this upholstery selection. The Premium Package ($1,550) brings safety and convenience features, while the Mutimedia Package ($1,150) provides advanced navigation features. Additional options that are must-haves include KEYLESS-GO ($550), wireless charging ($200) and an upgraded sound system ($850). This selection nicely outfits the A 220 with a high level of safety and convenience features. That brings our build of the 2019 Mercedes-Benz A 220 to a close with a final price of $40,885 before destination. That places it squarely in line with a well-equipped Audi A3. With fresh styling, a functional interior and smartly priced options and packages, the A-Class is sure to appeal to entry-level shoppers that may have found the CLA too small and the C-Class too expensive. While the A-Class can be equipped with more sporting details and styling than this build, the performance angle is best left to the CLA, at least until an AMG version of the A-Class is released.